Muskmelon or Cantaloupe or Kirni Pazham or Kharbuja – there are many names to the fruit. Muskmelon is a must buy fruit at my home during summers. It is rich in fibre, controls blood pressure, is an anti-oxidant and reduces the heat of the body which is so common in summers. Watermelons and muskmelons are perfect summer coolers. With its soft flesh and lots of water content, muskmelon sure reduces the body heat during summers. Most of the times i like to have the muskmelon as such as a fruit and in fact, muskmelon tastes delicious even by itself. But occasionally i do prefer to have certain variations such as having muskmelon crush, muskmelon juice and so on. 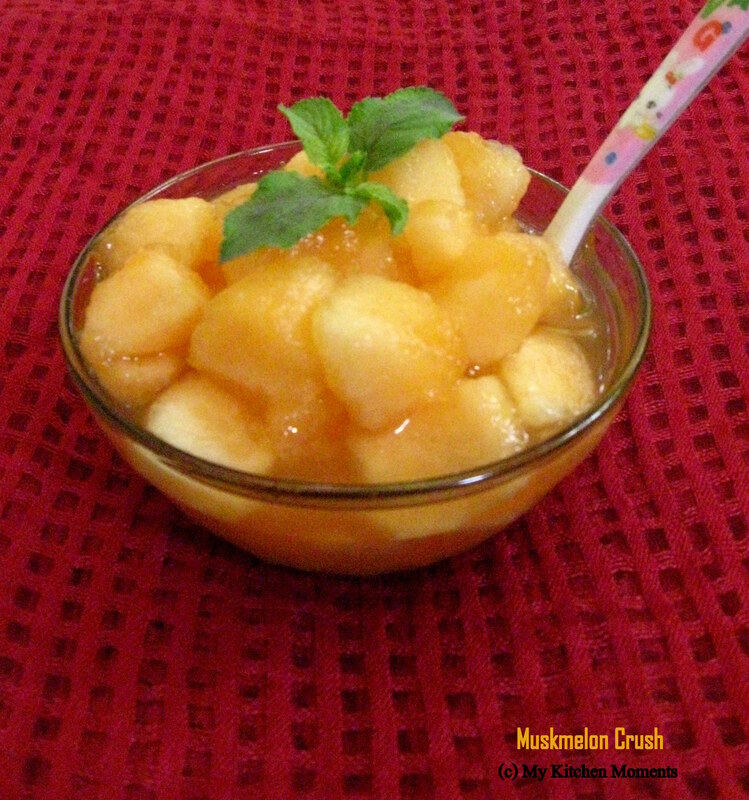 Today i am posting a simple muskmelon crush recipe, a perfect summer cooler. Rinse the muskmelon in water, pat dry and cut into half. With a spoon, scoop and discard the seeds in the center part and then slice them into long pieces. Remove the peel by separating it from the flesh. Chop the flesh into small pieces. Place the muskmelon pieces in a bowl, sprinkle the sugar and mix well. Decorate with mint leaves and serve. Serve the muskmelon crush immediately. Do not chill in the refrigerator as the taste will change a lot. So serve immediately. The seeds of the musk melon can be sun-dried and eaten after removing the outer layer of the seed. Or else, sun dry the seeds, roast and eat as such or use it in the salads, soups or halwas.